This is our custom-built Dual 13 AWG (4-conductor) speaker cable with overall (round) rubber jacket, made with Horizon SS4 wire. Dual means it carries two speaker channels for things like bi-amping or sub and main speaker sets. This is a heavy-duty rubber (PVC) jacketed speaker cable with great flexibility. These are excellent sounding cables and are perfect for live sound applications. 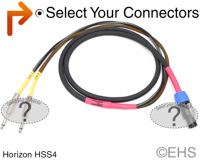 Pick the connectors you need: 1/4", Banana, Speakon, Fork or EP. If you pick 1/4", banana, or fork it will have a fanout of your selection with shrink color code. Photo 1 shows 6' cable with red master color label and yellow shrink color labels and 1/4" and Speakon connectors. Photo 2 shows one option for the two ends with red master color label and yellow shrink color labels and 1/4" and Speakon connectors.